(PhysOrg.com) -- One of the biggest unsolved problems in astrophysics is that galaxies and galaxy clusters rotate faster than expected, given the amount of existing baryonic (normal) matter. The fast orbits require a larger central mass than the nearby stars, dust, and other baryonic objects can provide, leading scientists to propose that every galaxy resides in a halo of (as yet undetectable) dark matter made of non-baryonic particles. As one of many scientists who have become somewhat skeptical of dark matter, CERN physicist Dragan Slavkov Hajdukovic has proposed that the illusion of dark matter may be caused by the gravitational polarization of the quantum vacuum. Like his previous study featured on PhysOrg about a cyclic universe successively dominated by matter and antimatter, Hajdukovics paper on a dark matter alternative is also an attempt to understand cosmological phenomena without assuming the existence of unknown forms of matter and energy, or of unknown mechanisms for inflation and matter-antimatter asymmetry. In the case of the fast rotational curves of galaxies, he explains that there are currently two schools of understanding the phenomenon. His ideas (like those in the previous paper) rest on the key hypothesis that matter and antimatter are gravitationally repulsive, which is due to the fact that particles and antiparticles have gravitational charge of opposite sign. (Though like matter, antimatter is gravitationally attractive with itself.) Currently, it is not known whether matter and antimatter are gravitationally repulsive, although a few experiments (most notably, the AEGIS experiment at CERN) are testing related concepts. Concerning gravity, mainstream physics assumes that there is only one gravitational charge (identified with the inertial mass) while I have assumed that, as in the case of electromagnetic interactions, there are two gravitational charges: positive gravitational charge for matter and negative gravitational charge for antimatter, Hajdukovic explained. If matter and antimatter are gravitationally repulsive, then it would mean that the virtual particle-antiparticle pairs that exist for a limited time in the quantum vacuum are gravitational dipoles. That is, each pair forms a system in which the virtual particle has a positive gravitational charge, while the virtual antiparticle has a negative gravitational charge. In this scenario, the quantum vacuum contains many virtual gravitational dipoles, taking the form of a dipolar fluid. He goes on to explain that the virtual gravitational dipoles in the quantum vacuum can be gravitationally polarized by the baryonic matter in nearby massive stars and galaxies. When the virtual dipoles align, they produce an additional gravitational field that can combine with the gravitational field produced by stars and galaxies. As such, the gravitationally polarized quantum vacuum could produce the same speeding up effect on the rotational curves of galaxies as either hypothetical dark matter or a modified law of gravity. As Hajdukovic explains, the effect of the stronger gravitational field can be understood by looking at what happens when an electric field rather than a gravitational field causes polarization. He gives an example of a dielectric slab being inserted into a parallel plate capacitor, which results in a decrease in the electric field between the plates. The decrease is due to the fact that the electric charges of opposite sign attract each other. 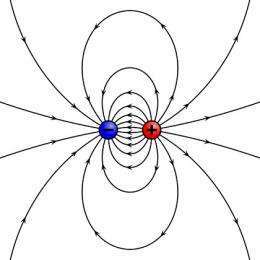 But if the electric charges of opposite sign were repulsive instead of attractive, then the electric field would increase. Back to the quantum vacuum scenario, since the gravitational charges of opposite sign are repulsive, the strength of the gravitational field increases. In his paper, Hajdukovic also presents equations in support of this scenario, one of which allows calculating the effects of the gravitational polarization at different distances from the center of a galaxy, which are in good agreement with observations. He also derives the famous Tully-Fisher relation as a consequence of the gravitational repulsion between matter and antimatter. This relation is an empirical law based on numerical data collected by numerous observations of galaxies and clusters of galaxies, and is still unexplained in the framework of dark matter hypotheses. Overall, Hajdukovics proposal lies in contrast with another concept proposed in the past few years by physicists Luc Blanchet and Alexandre Le Tiec. Although that idea also involves a dipolar fluid composed of gravitational dipoles, instead of being composed of virtual baryonic matter in the quantum vacuum, the dipolar fluid is a new form of dark matter. The dark matter is gravitationally polarized by the gravitational field of baryonic matter, such as massive stars and galaxies, which results in a stronger gravitational field. In other words, Blanchet and Le Tiec propose that dark matter in the form of gravitational dipoles of unknown nature can reconcile dark matter and Modified Newtonian Dynamics (MOND) theory, a modification of gravity; on the other hand, Hajdukovic proposes that virtual gravitational dipoles in the quantum vacuum can lead to a stronger gravitational field. In the end, Hajdukovic notes that much more work needs to be done before claiming that this possibility is the correct one. For one thing, the rotational curves of galaxies are not the only phenomenon that can be explained by dark matter. Observations of the cosmic microwave background, gravitational lensing, supernovae, and other data can also be better explained by the existence of dark matter than without it. With many scientists currently investigating dark matter and other alternatives, Hajdukovic hopes that new answers will continue to be discovered. Very well written article. There are a lot of theories waiting experimental evidence of anti-matter gravity, including this one. I think a serious discussion of the merits of this paper will wait on CERN measuring the gravitational attraction of anti-matter. Although using this model to derive the Tully-Fisher relation is no small feat, and lends some credence to the idea. The paper, published here this week, that shows how gravity segregates anti-protons and positrons in the Van Allen radiation belt, doesn't dash the anti-matter has anti-gravity hypothesis? @Shootist not necessarily, but it certainly doesn't help. There are alternative meathods for trapping anti-matter in the van allen belts then just gravity. All they really did was detect that the anti-matter was there -- the "how" and "why" of the observation are still up for debate. Regardless, CERN scientists claim to be close to ending the debate one way or the other. Once a strong measurement has been made a great deal of theories will either get a major vote of confidence, or be dealt a death blow. "Observations of the cosmic microwave background, gravitational lensing, supernovae, and other data can also be better explained by the existence of dark matter than without it." Maybe read the whole thing next time? Yes, that is a problem admitted to by Hajdukovic. But once again, this paper will only be taken seriously if (and that is a big IF) CERN tells us that anti-matter falls up. Gravitational polarization of the vacuum increasing gravity. I'd think this could also be proposed as a method by which anti-matter galaxies are "shielded" from matter galaxies. I doubt if anybody will throw any serious math behind it since the scientific community feels we are so close with measuring gravitation on anti-matter. fmfbrestel, you're dead on. The dark matter is not illusion (of matter) more, than any other gradient of space-time. We simply have no better explanation for matter, than just some space-time gradients or curvature. If the space-time curvature is real, then the dark matter is real, too. In addition, the dark matter serves as a trap for smaller particles (photons, axions, neutrinos, or even some positrons and atom nuclei). These particles tend to repulse mutually with their charge forces and antigravity, so they don't form compact clouds. Because they're lightweight, they're in thermal equilibrium with CMBR, so that they're moving with relatively high speed, which prohibits their condensation too. As the result, the dark matter observed is relatively complex mixture of space-time curvature (cold dark matter) and particles of different composition (so called warm dark matter), which are exhibiting apparent drag during collision of galaxies. Therefore my conclusion is, Mr. Hajdukovic's theory is relevant in certain extent, but it cannot explain observations like this one, where the particle nature of dark matter manifests clearly. The gravitational polarization itself would not create such a tails and drag brushes. I suppose that if such an effect were real, it would make the gravity field around super massive black holes rather interesting. As if it weren't interesting enough already? Masses of quarks are much less than 1/3 of the baryon according to QCD theory .The rest of the mass is attributed to confinement dynamics ,spin etc . I would assume the same is true of antimatter and gravity as I understand it is a phenomena associated with mass/energy concentrations so it's difficult for me to imagine that antimatter should have negative gravity without also implying negative quark confinement energy . Mr. Hajdukovic's theory is relevant in certain extent, but it cannot explain observations like this one, where the particle nature of dark matter manifests clearly. The gravitational polarization itself would not create such a tails and drag brushes. I don't know that you can make that assumption. Our Earth-bound intuitions and conventional wisdoms are not the best tests for such cosmological events. Let's wait for the mathematics to have their say. Assumptions must be made to suggest that the observations of the bullet cluster manifest clearly the particle nature of dark matter (i.e. : 'dark' particles being displaced from 'normal' particles, passing straight through, without reacting much or at all). The idea that the baryonic matter was displaced from polarized virtual dipoles seems no more or less implausible to me than being displaced from the as yet only imagined 'dark' particles. The mathematics will be the real test. I'm going to wait for it before I judge. I do not know if the weakness of gravity is a problem ,but the short lifetime is not a problem; vacuum polarization is an experimental fact in quantum electrodynamics. My understanding is that equivalence experiments such as this one (P. G. Roll, R. Krotkov, R. H. Dicke, The equivalence of inertial and passive gravitational mass, Annals of Physics, Volume 26, Issue 3, 20 February 1964, Pages 442-517) pretty much ruled out negative gravity for antimatter. Energy mass equivalence also argues against it. A experimental fact as caused by what field? Not gravity, right? This seems to me, to be a continuation of the question of the gravitational effect on anti-particles. It is a falsifiable premiss. All someone has to do is to start an antiparticle moving down a tube at slow velocity in vacuum (they have already been slowed to a stop in Penning traps). Carefully shield them and see if they move up or down in the Earth's gravitational well. Do the same for control particles. See if you see a difference. If you don't, enhance the controls and start over until you have either confirmed the effect of falsified it to an arbitrary number of decimals. This is not even a difficult task. Why hasn't it been tried? but how do virtual pairs combine near instantly if they are mutually gravitational repulsive???? or does the electrostatic force overrules on such short distances???? All someone has to do...This is not even a difficult task. Why hasn't it been tried? Seriously thermo? Are you trolling today? We haven't been able to contain anti-matter for more than a few pico seconds until just recently and you ask why we haven't observed its behavior in a "carefully" shielded tube? We're working on it, but it isn't "not even a difficult task". Those are the AEGIS experiments mentioned in the article and the comments. And yes. Falsifiable. Second question first, yes, I think so. First question: in my mind I think of the proposed polarization as resulting in a shell of virtual matter surrounded by an anti-matter shell in a further layer. Each successive layer of virtual pairs has the matter cancel the previous layer's anti-matter, leaving, essentially, an inner matter shell that strengthens the gravity field and an outer anti-matter shell off in the distance. With an electric dipole the positive is attracted to the negative, weakening the field. In gravity the like attract and increase the curvature. Truthfully it seems like nonsense to me since each virtual pair should cancel itself, but that was how I thought of it. Pyle: Thank you for considering me a "troll." Coming from you I will consider a real honor. Of course you are completely wrong when you stated: "
"Seriously thermo? Are you trolling today? We haven't been able to contain anti-matter for more than a few pico seconds until just recently and you ask why we haven't observed its behavior in a "carefully" shielded tube?" Might be a bit wrong. Back to the present situation. They have been able to bring antimatter to a stop in a magnetic trap for 16 seconds. All that needs to be done is to send them slowly on a path through a gravitational path to see if they are attracted to the earth or repulsed. The same should be done for normal matter as the control. Even you should be able to see that one of many next steps. Thermo: I apologize if my weak attempt at humor was ill received. You are the least likeliest of troll-dom here. your voice is always one of reasoned discourse and you are almost always a reliable source of information. When CERN first created and trapped antimatter, back in November 2010, researchers held onto the fleeting antihydrogen atoms for just 170 milliseconds, or a tenth of a second. Again, not even a year ago. OK, pico seconds might have been a little hyperbole, but I haven't seen many experiments measuring the gravitational pull of a fleeting number of atoms for any material, let alone ones that must be contained in magnetic traps. And yes, I agree, it is one of many next steps. I only meant to diffuse your "Why hasn't it been tried?" comment. A particle-antiparticle pair can only form a dipole if it is bound together by a non-gravitational force (the gravity between particle-antiparticle is rejective). So what is this non-gravitic force that binds the particle-antiparticle pair? The electric force? Dr. R.M. Santilli has suggested repulsive force between matter and antimatter many years ago. A particle-antiparticle pair...So what is this non-gravitic force that binds the particle-antiparticle pair? It ain't a pair. It is a virtual pair. It is bound by it's non-existence. This is a quantum effect. Virtual particles popping into and out of existence. If real particles were created they would either go boom! releasing large amounts of energy or fly away. In either case they wouldn't be virtual and the sky wouldn't be dark at night. Didn't Einstein prove that gravity is not a force but a distortion of spacetime? Please type slowly as I'm just trying to understand. I have a theory about dark matter; Dark matter is lacking the Higgs Boson. Maybe the Cern can investigate what is left over when they knock the Higgs Boson out of an atom. I just want to respond to shootist and antialias, and apologize if someone else already made these points. 1. The antimatter trapped in the van allen belt is because of electromagnetic forces. It it were trapped by gravity only, it would interact with the upper atmosphere and destroy itself. 2. - Antialias. All of the effects ascribed to dark matter are because of its gravity. If this process provided the same amount of gravitational effect, then the same cascade of evidence for dark matter would be equally valid to this idea. 1. Not really. The scarcity of matter in the outer atmosphere is what keeps it from interacting, I think. Whether it is electromagnetic forces or gravity as soon as it comes into contact with it's matter pair there would be a bang. If anti-matter exhibits repulsive gravity then yes, it is EM forces keeping it there. 2. Yup. Maybe. Or maybe not. It will be up to future research to show that this polarization of virtual pairs can explain the same gravitational lensing and influence on the CMBR. If it were as simple as you say then Hajdukovic likely would have just said that rather than acknowledging them as he did. @Burnerjack: Gravity is modeled in General Relativity as spacetime curvature. Can polarization of virtual matter/anti-matter pairs increase spacetime curvature? Hajdukovic thinks maybe this is so. How does it all fit in SUSY. Anybody? I like the sound of this idea. I have no evidence, it just seems to be more pleasing and likely... (and also we may get those 21st century hovercars we'd all love). If gravity traps antimatter, and it's the only force trapping it, then it would pull the antimatter toward the planet. If it is repulsive to antimatter, then something else, ie electromagnetic force would be needed to trap it, otherwise the anti gravity would push it away from the earth and it would not be trapped. Whatever the situation on gravity, we already know that it is electromagnetic forces, it is not really at question. IE, I believe we all read that article the other day about it - the science behind it is more basic and pretty sound to boot. I avoided using phrases like 'bang' and annihilate because there are a lot of kids on here who would take it wrong and think explosion and make the conversation all stupid. There would be no bang. the concentration is so low that it would make an imperceptibly small flash of high energy photons. Might it not be possible that it takes a particle (dark or light) to create that polarisation? I.e. the polarisation is a response to its presence? No bangs and bright flashes - takes all the fun out of it. Hyperbolic electrons exhibit a Fifth force that is gravitationally repulsive and has been demonstrated beyond doubt by Dr Randall Mills. Who moved my medication? Positrons (Anti-Matter) can be produced in large quantities over significant times, are they exempt from testing for gravitational effects? I could accept the claim that "dark matter may not exist and that phenomena attributed to dark matter may be explained by the gravitational polarization of the quantum vacuum" if it weren't for the previously accomplished dark matter mapping - in 3D, of all things! I mean, dark matter exploration is not in the domain of theoretical physics anymore but in the domain of everyday astronomy. This is an exciting theory. If it proves out experimentally, we ought to be pleased: we end up with simpler physics, and we also learn that baryonic matter can influence the polarization of virtual particles in vacuum, which in turn can produce gravitational lenses. That's a very good day's work, if it proves out. Ms. Zyga did a fine job of explaining this paper to a lay audience. Thank you. I took a quick look (a lecture about to start) at the hubble images and I highly agree with you! Besides, the 'what is' and 'how is it doing it' (mechanism) isn't exactly being elaborated on here. This sounds suspiciously like a convenient, vague and untested assumption, just in order to 'make the theory work'. That is another reason I am having a hard time accepting the basic premis of the article. Consider that cumulatively, humanity has made less than a gram of antimatter. "Large Quantities" is a very relative term. Have you weighed a pound of electrons, blue? Positrons and Electrons are extremely light, and kinetically mobile. They are only really "stopped" when rotating around a nucleus. So anti-protons, being magnitudes heavier and much easier to slow down and sit still, would generally being a more practical choice to use for gravity experiments. I disagree with myself all the time. Why shouldn't you? Nah. To be really extreme, the moon doesn't get pulled to the planet, but is instead in orbit. ;) But really, there are lots of reasons why that antimatter would be where it is. In fact, the article doesn't really say how "old" the antimatter is. It probably only lasts for short periods of time anyway and does not have to really worry about falling. It is thought to be created by cosmic rays so it could have all kinds of velocity. But really I am just being a jerk. ER no doubt accounts for most of its staying power. Yup, good idea. Single M/AM annihilations and unstable AM decaying are probably best described as small flashes. DM is still just a plug. Might it be something? Yes, that is the prevailing thought. Might our observations be explained by modified gravity or virtual pair polarization? Less likely, but possible. I guess. Polarisation is always caused BY something. Yup, in this case it is caused by the mass of the galaxy the vacuum surrounds. Well, that is what the author says, but I find it pretty wild myself. @tg: THRICE IN ONE DAY!!! Electrons are extremely light, and kinetically mobile. They are only really "stopped" when rotating around a nucleus. I was going to forgive the weighing of electrons, but ROTATING? Really? Come on now man. For not wanting to say bang, all of a sudden to fall into rotating electrons? If only you were really thinking of the children. Doubtful. Legitimate 3-d requires depth perception, and a single telescope cannot really give you that, even using red shift as a metric for distance. Moreover, taking multiple frames over hours or days as the telescope orbits earth, and as earth orbits the sun, well, that would cause smudging of the stars in the reference galaxies as they will have moved through time and space. What they tried to do was jury-rig a "3-d" image, and the deep field and ultra-deep field, using just one telescope, when clearly triangulation in 2-d requires 2 telescopes, and in 3-d requires 3 telescopes ideally, since you are looking across such vast distances. You can have a point, a line, or a triangle (a plane). Binocular vision works on earth for animals, but insects and Spiders do not even stop at binocular vision. Additionally, because Cosmology deals with large timescales in which the exact time and location of an event are hardly ever known very well, it makes sense to have a triangulation approach to any alleged 3-d imagery. When photographing distant objects, such as at the edge of our own galaxy, or in another galaxy, it makes sense to have maximum distance between the two, and preferably 3 or more telescopes. Therefore it would really requir at least 2 or 3 non-colinear telescopes spread around in the solar system (i.e. one orbiting mars and another at Jupiter. Now if you could do THAT, and get it as close to synchronized as possible, then you would take your photos when Jupiter is in opposition to Mars, maximizing the distance from them, thereby allowing the maximum viewing angle between their respective telescopes. Hopefully, when this happens, Earth would be at some non-colinear point, forming a triangle. This would give you a viewing angle above or below the Mars-Jupiter line, giving an extra dimensional perception. Thanks for elaboration on triangulation. NASA people were a little more advanced: they used gravitational lensing and computer simulation to generate their map of dark matter in a galaxy cluster 2.2 billion years away. Didn't Einstein prove that gravity is not a force but a distortion of spacetime? Indeed. Can anyone suggest an appropriate geometry to explain Anti-Gravity? Beware the Dark Side forces children. Gravitational lensing is unreliable at best, since you don't actually "know" the mass of the lensing galaxy. You are forced to make a bunch of assumptions, or else have the model make random guesses, or try all possibilities between some presumed range, and then you pretty much end up making an arbitrary guess based on human biases. It's kind of like looking through one of those concave walls at the aquarium, where you are never quite sure how much distortion is really occuring. Moreover, gravitational lensing isn't going to give you "3-d" anyway, even if you get lucky and get all your assumptions correct. For a bit of a self-referencial analogy, one "eyeball" doesn't give a 3-d image, even if its looking through a telescope. NASA did not use gravitational lensing on the deep field and ultra-deep field. When that was done, heck it wasn't even NASA, they had the telescope take photos on many different days of the year of the same area in space, often many days or weeks apart. Well gee, you can't super-impose those on one another and call that an "composite image", because everything both here and there has moved, and isn't even in the same spot. This is why everything in the deep field and ultra-deep field looks like somebody with a Myopia. Trust me, I know what Myopia looks like, as I'm blind as a bat without correction. It looks like a halo of blurred "ghost" objects around any point light source at night. Wow, that's exactly what everything looks like in the deep field and ultra-deep field. The novices took pictures from different times of the year, FROM a moving, orbiting object OF a moving objects, and super-imposed them as though it was static, one frame still photo. What SHOULD be done to compose a 3-d mosaic is like I said, use triangulation, but give every photo a time-stamp which will be used to model an actual 4-d representation in a computer simulation. By using triangulation across a much higher viewing angle, and time-stamps, you can place every object when and where it belongs in the mosaic in space and time, by projecting them into a 3-d model space and placing them at the intercepts; and you will have viewed every object from 3 different viewing angles to maximize depth perception and spacial references within the individual frames. This would allow you to represent the observations ni an honest way, which doesn't come off as presenting itself to be something it's not, and doesn't come off as concealing the drawbacks of the techniques employed in it's production. - proving the whole idea of anti-matter exhibiting negative gravity is non-sense. Infinite amounts of nearly free energy would look an opportunity for huge profits to some people! Can you hear the chorus, Rev-en-ue, rev-en-ue! Electric Universe...Who needs dark matter illusions when you have plasma. Regular matter is derived from the vacuum as well. The quantum vacuum is teeming with particles spontaneously emerging in new 3 dimensional coordinates. A particle is not constrained to its 3D coordinates the object is. Energy permeates the field and extradimensionally gets randomized throughout the field. This is a quantum jump. The timelessness element. How do particles transvert the 3D field instantaneously? This is a transference exceeding light speed. What does this say of reality? When charges have equal opportunity of appearing anywhere on the field at any given time with a preference for a particular local, the object is comprised of particles. One moment the energetic particle is here the next moment it's there. This is superluminal travel. I think we have light all wrong. Light is a vortex created by information transference through the Higgs field. The particle jumps creating a light wave. Light is a pressure vortex reaction to transference. 'Through' as in cutting, perforating the Higgs field, the particle jumps through the Higgs field by cutting, wormholing, creating superposition, this one particles currently located in two separate locations loses the first location and positions in its new 3D coordinate. Particles teleport which means rules allow for instant transference. A cut in the field is massive. Energy cuts through the field leaving ripples (we see this as light). Light transfers between galaxies. This means particles transfer (superposition) between galaxies. This means the field between the galaxies is perforated. This means that the field in-between galaxies is massive. We can't see this mass because what this mass is is a network of wormholes connecting everything together. The space surrounding the galaxy plays a role in holding together the galaxy. the field creating dark mass. Energy creates mass. How is this an illusion? Terminology wise rightly so. Dark Matter is a misnomer. Matter is both massive and is visibly so, it is energetic. Matter is clearly defined. Dark 'Matter' is better appropriately labelled as Dark "Mass". I guess technically it is correct. Dark matter is an illusion. If antimatter falls ..., it should be possible to extract infinite amounts of energy from nowhere by ... extracting some energy when they do. Ummm aren't you forgetting the massive amounts of energy you need to make the particles in the first place? Me be thinking your perpetual energy machine be flawed. Some particles are their own anti-particles. Do they fall up or down? Pretty sure they are massless so...Fall? Well WIMPS are a possibility, but those ones aren't observed, just theorized. WIMPs for DM or anti-gravity for virtual polar bears. Or something like that. Anyway, we don't need both methinks! "We can consider our universe as a union of two mutually interacting entities, Hajdukovic said. The first entity is our normal matter (hence we do not assume the existence of dark matter and dark energy), immersed in the second entity, the quantum vacuum, considered as a sea of different kinds of virtual dipoles, including gravitational dipoles." Would somebody be willing to rephrase that, so that I might be able to build a better mental image that includes those dipoles? Correct me if I am wrong, but doesn't a dipole have a -ve (as well as a +ve one)end, no matter what the type of force/field? Wouldn't this be a setting that does allow for anti-gravity? Yup, in this case it is caused by the mass of the galaxy the vacuum surrounds. Well, that is what the author says, but I find it pretty wild myself." Can they say with any certainty that dark matter is actually massless? Why are they so keen to exclude it??? I would LOVE any theory that reduces the cosmological constant calculated by our current understanding of the quantum vacuum (somthing like 10*100*20), to 0 (or extremely close to it). Besides requiring that all particles that are also their own antiparticles are mass-less, this implies that virtual particle pairs never generate a gravitational field, except possibly as hawking radiation near the boundary of a black hole. Forget concentrations of anti-matter folks. This explains a TON of mysterious stuff. Is there ANY gap in any of these types of theories that CAN'T actually be explained away by filling it with a virtual version of SOMETHING? This seems to be becoming some kind of norm, something to default back to, whenever it gets difficult. I don't know about you guys, but I have been seeing the word 'virtual' used routinely in so many different contexts in physics that I am actually losing track of what it is supposed to mean (or what I thought it did), through sheer overuse and exposure. Could somebody either agree with me here, or help me reset my definition, please? You are right Parsec, if virtual pairs are gravitational dipols the cosmological constant problem is trivially resolved. However, the question is if non-random distribution of dipoles can produce tiny non-zero value of the cosmological constant. (2011). "Retrocausality and Signal Nonlocality in Consciousness and Cosmology", The Journal of Cosmology, Vol 14. (2011). "Dark Energy and Dark Matter as w = -1 Virtual Particles and the World Hologram Model", Bulletin of the American Physical Society, Vol 56, No. 4, April 2011 meeting. with Creon Levit (2009). "The emergence of gravity as a retro-causal post-inflation macro-quantum-coherent holographic vacuum "Higgs-Goldstone field", ArXiv.org, January 2009. No, because you can always get that back by just allowing the particle/antiparticle to destroy each other. Sure, but I think that you are trivializing this. To get the matter back to the anti-matter you have to overcome the gravity well you used as your energy source. You could use other means, but still, no net energy gain. Not that you couldn't make a battery this way, just not perpetual energy. Even if they are mass less and are constrained to a specific volume they fall. But even if not constrained would an anti-photon increase it's energy in a decreasing gravitational potential while a photon decreases it's energy? Lost me here. Anti-photon? Isn't that just a photon? Photons just travel a path. When spacetime is curved, they follow that path. Way unsure of myself here. But I get your point. What makes you think that virtual particles are all particles that are their own anti-particles? Are there no virtual electron pairs composing the vacuum? Are photons incapable of interaction? Can not a gamma ray not give rise to an electron/positron pair? I think you took Parsec's comment out of context. I took it to mean that in addition to requiring Majorana particles to be massless - even p/a-p pairs that have mass cancel eachother's gravitational effects creating a net field of zero. On the photon point above, I deleted a sentence on accident. I think photons would appear to be "attracted" by AM just like M. Rather than being gravity wells they would be mountains, still bending light. Indistinguishable to us distant observers. First, the idea of holographic Universe is completely different from the work of Mr. Hajdukovic. In addition after some search I have found the following arxiv preprint, much older than your work. I am not going to say that you have stolen the idea of Mr Hajdukovic, simply because they are two completely different ideas. This might be a dumb idea but is it possible that dark matter is actually micro black holes produced in large quantities during the big bang? Possibly huge numbers of tiny holes that didn't get the opportunity to grow into super massive holes? ROFL .. Are you going to call it the deathmobile ? Even if it works , i wouldn't like to anywhere near 1000lb's of anti-matter. Is it enough to take out a small moon ? Why not, if these "micro black holes" are actually quite normal particles of matter. And they're formed all the time all around us. Interesting results, but they may be moot as the stellar and galactic cluster revolutions speeds can be modeled using general relativity alone, without invoking dark matter (Cooperstock, et al). If antimatter falls up then by generating particle/antiparticle pairs and directing them either toward or away from each other depending on their particle/antiparticle state, it should be possible to extract infinite amounts of energy from nowhere by having the particles fall up and fall down at the appropriate times, and extracting some energy when they do. There are ideas along those lines, like accellerating a ship to relatavistic speeds - Theoretically, once you go fast enough, you affect a virtual particle before it can re-combine with it's pair. Then it "becomes real" so to speak, and you can harvest it. theoretically you would be harvesting energy from the fabric of space, so called zero point energy. And so on and so forth. It's still fairly well into theoretical territory and not proven to be true tho. and if it is true, it is highly impractical or impossible with current tech. Regular matter is derived from the vacuum as well. The quantum vacuum is teeming with particles spontaneously emerging in new 3 dimensional coordinates. You can imagine it like the condensation of droplets from saturated vapor. And the dark matter is something like haze or mist surrounding large condensed droplets. Or like the breaker waves surrounding the islands. Now THIS is a hot topic. @thermodynamics: I like your idea of observing the behavior of antimatter in a trap to see if it is attracted or repulsed by the normal-matter Earth... but wouldn't the forces that keep the antimatter trapped overwhelm the gravitational force you're trying to measure? My solution would be to observe where in the trap the antimatter ultimately annihilates, as it inevitably always will, at an apparently random position. Run the experiment multiple times, and the numbers will show a statistical bias in favor of one conclusion or the other. 1. I have found the link to the AEGIS experiment at CERN, designed to measure the gravitational acceleration of atoms of antihydrogen. contains link to a publication predicting that as a consequence of the hypothetical gravitational repulsion between matter and antimatter, supermassive black holes should be point-like sources of antineutrinos; a phenomenon that may be observed at the Ice Cube at the South Pol. Why the pile of matter should emanate just the antimatter? It's well known, the dark matter (or at least some aspects of its behavior) can be explained with modifications of general relativity (there actually many of them). But just these modifications will violate equivalence principle in its consequences - thus making the whole solution intrinsically inconsistent. It's logical, because the dark matter itself was originally revealed as a violation if general relativity (i.e. with gravitational lensing, which doesn't correspond gravitational field) - so that general relativity cannot be used for its explanation. As a non-scientist, I'm confused by what seems to be making gravity seem more and more like a force. How does this square with general relativity and the warping of spacetime as the source of gravity? According to modern physics, what they tell us is only the effect (the predicted result) got from the theory; it is something like they play magic. Anyway, magician know how the magic work, while physicist not? Large structures such as galaxies trap a large percentage of their gravitons and thus exhibit the appearance of greater mass. Note that smaller structures such as solar systems do not exhibit the illusion of greater mass because they cannot trap a graviton cloud. Gravitons (should they exist) are massless. measurements from other locations. From far enough away I can't tell the difference between a soccer ball or a volley ball, further still and I don't see them at all, our visual boundary is 14 billion years, our time/distance measurement, first thing that's required is travel outside space and time, from there measurements can be made, and at that point we'll be able to prove these theories. Scaling out would cause superluminal travel. 5. Bending spacetime back into itself. 6. The universal singularity. The ability of the universal constituents to position anywhere at anytime in the universe the components of materials (charge) constitute the atomic nuclei, atoms, molecules compounds and so on.. The charges create reality, they are not bound by realities law they have loopholes the ability to exit one universal point and enter another. Spacetravel is a deathwish. Should you speed up to c there would be no diversion procedure should 'dark matter' "appear". Matter has the ability to emerge or/ Matter has the ability to appear. The darkspots could be spots that reality rides on. Like tracks. Energy brightening up points of mass which are space and the energy that rides them is time. "supermassive black holes should be point-like sources of antineutrinos"
Has anyone considered the effect on the varous dark stuff theories if time and or distance are not constants everywhere? It would explain hyperinflation (time shrinks or distance expands) and most dark junk hand waving. We presume everything else is fungible to satisfy a pet theory but no one is presuming that time or distance is a constant? The easiest culprit to investigate might be what happens if plancks contant isn't? Yes, gravitons are massless, but their effect is gravity. Thanks for the link, Gagain. I'll give it a look-see. So there must be anti-gravity then. If virtual particles become "real" when a spaceship is traveling near light speed, then wouldn't the craft suddenly smack into some kind of dense fluid or gas of particle/antiparticle pairs instead of empty space? That would be pretty catastrophic to the continued existence of the craft, I would think. I hope I'm wrong about that. If antimatter particles have a negative gravitational charge, wouldn't this mean that they would be repelled by black holes? Antimatter particles formed in an accretion disk near the event horizon would be accelerated outward to near c speeds, so we could expect to detect them using particle detectors. And what would happen to antiparticles formed within the event horizon? Wouldn't they be expelled, violating many black hole theories? Such particles would have very distinctive energy levels. Is this a viable resolution to the quantum information paradox? Also, if antimatter does create a negative curvation of spacetime, this might have interesting repercussions for the Albicurre warp drive, which hitherto required theoretical negative mass. My instinct is that if antimatter was anti-gravity, we would have observed it at the astrophysical level by now - but I Am Not A Physicist! Hey, thanks for clearing that up. If antimatter particles have a negative gravitational charge, wouldn't this mean that they would be repelled by black holes? Yes, here are some theories about it. In my theory antiparticles repulse mutually, but they're rather indifferent to particles of matter. IMO they're repelled rather with gradient of negative space-time curvature, which is formed around such a black holes. gravitational dipoles, gravitons, massless yet confer gravity to mass. then quantum vacuum being full of such dipoles. As another writer said, this would explain 'c' as a kind of 'terminal velocity of a falling object through a viscous fluid within an assumed constant gravitational field intensity'. It would also mean Dr. Hawking is right in another way....gravitational black holes permeated by the quantum vacuum carry within themselves the seeds of their own destruction; and that Dr. Alcubierre's name will one day grace a plaque on the bridge of our first warp drive starship. The generation and use of these massless dipole graviton pairs in mass numbers in a 'warp reactor' that brings them into being and de-racemifies them will result in a localized space-time warp that will be our surfboard to the stars. What is the alternative to anti-matter having negative gravity? Specifically, when a virtual particle pair pops into and out of existence in the vacuum the electric charge of the M and AM cancel eachother out, so no net field. If they don't have balancing gravitational effects, doesn't the "popping" create a discontinuity in the curvature of spacetime? Now, uncertainty tells us that this is the case anyway since stuff can be popping up all over the place, but with a real particle the curvature is there, just not well defined spatially. With the virtual particle pair, it isn't, is, isn't and that would be flat, curved, flat. Right? As I mentioned above, I could see how polarization of the gravitational dipole could lead to a slight increase in the gravitational field. Maybe if the polarization idea is wrong, it is just the virtual particle's positive mass that needs to be accounted for to take dark matter's place. Denser vacuum near galaxies? Nonsense I think. Think beyond incomplete Plane-from Earth. Why science is not advancing beyond sun ? Look from heart and Center of Universe-say 100,000 Ly beyond Milky way. knowledge must prevail through Nature and Philosophy. Cosmology Vedas Interlinks- leads the way-Lead Kindly Light. Denser vacuum near galaxies? Nonsense I think. After all, it refracts the light like some dense matter. You can think, such vacuum is full of photons, axions and antineutrinos. I'm in suspicion, these thingies are responsible for effects like the Lense-Thirring space-time drag. The average speed of neutrinos, which are in thermal equillibrium with CMBR radiation is ~500 km/sec, i.e. lower, than the escape velocity of the Sun. Such neutrinos will therefore concentrate around Sun and another massive bodies, not to say about whole galaxy. I can't see, what u mean. I can recognize logical arguments only. 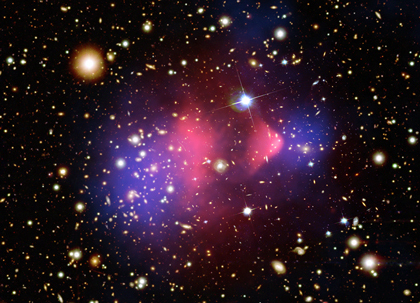 Dark matter is considered massive in all cosmological models. Well, simply having positive gravity. As long as A-M has positive mass/energy, by all rights it should have positive gravity and distort S-T in the same way regular matter does. Apparently not. You have to remember that to bring the virtual particle pair (fleetingly) into existence the energy of the vacuum drops by the equivalent of their mass/energy and is restored on annihilation. This keeps the gravitational/mass/energy balance sheet at zero at all times. It's also the reason a BH would shrink as the particle PAIR creation is "borrowed" from the event horizon, but only one is returned if the other escapes. Virtual particle pair creation should also be something different from matter-antimatter pairs. Matter and antimatter annihilate when brought together: which causes a photon of equivalent energy to be emitted. Virtual particle pair destruction causes no such photon emission. Virtual particle pairs are not REAL, they are the POTENTIAL of the vacuum. It takes energy for the virtual particle pair to emerge in REALITY, but, when the particle and antiparticle pair emerge (even if only briefly) they are no longer virtual. No such thing. Virtual particles are the potential of the vacuum, when the particles are "created" they are no longer virtual. Again, virtual particles don't annihilate, you could say that: virtual particle pairs emit virtual photons when they virtually annihilate. Matter antimatter pairs emerge in REALITY because of the vacuums potential. Stating that VIRTUAL particle pairs emerge in reality is false (they don't), REAL particle pairs do. Virtual particle pairs are the vacuums potential. Their emergence is the fulfillment of that potential rendering them as a real particle antiparticle pair. This applies no matter how briefly the pair is in existence before annihilation. Virtual particles 'borrow' real energy from the universe. E=mc^2. Real energy means real particles. When the particles annihilate (or 'return' the energy) they return to their virtual (potential) state. It seems matter curves or shapes spacetime in one way (I would guess compression) and anti-matter shapes spacetime in the opposite way. The lowest energy state of spacetime would be one in which the distortions of anti-matter are minimized. That is, regions of space where anti-matter aggregates put much more stress on the spacetime lattice than a more uniform distribution. So the lattice forces separate anti-matter particles to minimize the stress. I would think not only does the lattice separate anti-matter, but compressed regions of the lattice (by matter) repulse the uncompressed or expanded regions of antimatter. Anti-matter is banished to the farthest regions of spacetime. Once it reaches these distant regions it would be free to aggregate if there are any attractive forces. It would seem that this segregation confirms the anti-gravity hypothesis. So as you fill a containment vessel with anti-matter, if possible, it would get lighter and when there is more antimatter contained than matter in the vessel it would begin to float. If the space-time curvature is real, then the dark matter is real, too. I never could understand that argument. We know matter curves spacetime. Spacetime is curved so there has to be matter there? Is there no other way for spacetime to be curved? Certainly there must have been some turbulence during inflation of space-time after the big bang or whatever it was. Well I guess photons fall down. True. Per M. Villata, as discussed in Wikipedia, the gravitational interaction between matter and antimatter is mutually repulsive, and could potentially explain the observed expansion of the Universe without the need for dark energy. Photons move in a straight line. If they *appear* to move in any other way it's due to the curvature of space (which we cannot perceive) or due to a change in the medium they travel through. But from the point of view of the photon it's always a straight line. I believe gravity is curvature of space which we can perceive. As for photons falling down, as I understand Newton light objects fall at the same rate as heavy objects. That is, curvature in spacetime does not depend on the weight of the falling object, at least to a first approximation. So certainly photons would be as light as they come. I believe gravity is curvature of space which we can perceive. If we could then we'd see all photons travelling in straight lines - but we don't. We think there are such things as 'gravitational lensing'. While this may seem like a distortion of space at first it is, to us, a distortion of the path of light. So no: we don't perceive warped space. Photons don't 'fall' because you can't accelerate them. They always travel at c (for a given medium). all you get is an (apparent) shift in frequency. That again is a an inability to perceive warped spacetime because the photon itself doesn't change. We think there are such things as 'gravitational lensing'. While this may seem like a distortion of space at first it is, to us, a distortion of the path of light. Light travels in straight lines relative to space unless it's reflected. Any apparent distortion is due to gravity, that is, curvature in space. That's the idea of gravitational lensing. Gravity around the object bends space and light follows right along. Light behind the object is bent towards us so we can actually see what's behind the object. Light has no way of knowing what a straight line is, only that it has to follow its path in space, curved or not. Light takes the shortest path in space-time (note the 'time'. This ios different from saying it takes the shortest path in space). It follows a minimum principle in this as any other path would mean a longer path in space-time. The shortest path in space-time is a straight (space-time like) line. Light doesn't bend in spacetime. Since we are unable to perceive spacetime we sometimes see light as going around in curves. We only perceive space and have no ability to perceive differences in time-qualities over a given volume. In which case light travels through space-time unlike other objects in free fall. The shortest and quickest path between the earth and its position in 6 months is straight through the sun. The shortest and quickest path between the earth and its position in 6 months is straight through the sun. In space - yes. In spacetime - no. Just google 'spacetime diagram' to see what the difference is. The quickest path in space is the shortest path in space-time. Photons don't 'fall' because you can't accelerate them. visible photons have been slowed to a dead stop for a period in which they would otherwise have travelled some 200 km. In the article the speed of light was altered due to forcing it to travel in a medium. It would have travelled 200km in that time if it had travelled in a vacuum (but it didn't). If they *appear* to move in any other way it's due to the curvature of space (which we cannot perceive) or due to a change in the medium they travel through. Which part of 'medium' don't you understand? Medium looks pretty good. Appear and perceive seem a bit foggy though. Really? Why don't you both step back and rethink a bit. ap: The "light stopping" paper is about storage, not transmission through a medium. The photon actually stops until it is pushed out by the next photon. The transmission through the medium may be slowed, but the last photon in doesn't make it out until the next photon enters (as long as the other conditions are maintained). In other words, it is different than what was being discussed here. As for photons falling down, as I understand Newton light objects fall at the same rate as heavy objects. That is, curvature in spacetime does not depend on the weight of the falling object, at least to a first approximation. So certainly photons would be as light as they come. Newton? curvature? weight? photons? light? Really??? Do you enjoy word salad? Thanks for the update on photon storage. As for the words if you think these are word salad maybe you should stick to pseudo-science. The words aren't word salad. Your sentence was word salad. As AP said, photons don't fall. Describing photons to be "as light as they come" is either a poorly conceived pun or just plain nonsense. Trying to understand a photon's interaction with mass wrt gravity can't be done using Newtonian physics since a photon is massless. Photons interact with gravity by contributing to the stress-energy tensor. Newton's gravity requires mass. It's why GR replaced Newtonian gravity. All of your posts hint at something, but seem to be firmly grounded in a misunderstanding of GR. Maybe you should stick to COBOL. I'd like to take back the last sentence of my post. This site provides a sounding board to toss ideas out during my continuing self-education in science. I guess pseudo-science is fair, so I'll stick to it. I definitely am not conducting scientific research. Just trolling a scientific website and sniping. I'd like to add to some of my previous posts. With the M-AM virtual pairs popping in and out, I think the idea of quantum foam handles this, in that at any particular point in time the shape/curvature of the vacuum is chaotic. Even if the virtual pair has popped in, the net curvature should be that of the surrounding vacuum with a dip and a bump, as it were, resulting from the borrowing of energy from the surroundings. I see where I went wrong. Hajdukovic's polarization of the foam is a clever idea that might have something to it even w/out anti-gravity. At least when I think about using the bowling ball on a trampoline analogy. Pseudo-science. But AP, not stoned. Your sentence was word salad. Sorry. I count 3 sentences. All of them? Describing photons to be "as light as they come" is either a poorly conceived pun or just plain nonsense. Trying to understand a photon's interaction with mass wrt gravity can't be done using Newtonian physics since a photon is massless. Yes I would say massless particles would be as light as you can get. Point being if you attempted to describe massless particles as the limit of low mass, it seems the falling principle would still hold. The Perimeter Institute is pretty cool. We need more public/private institutions like it and they need more support. Maybe people could throw money at them rather than the mega churches. Oh well, I digress. Anyway... longest path in spacetime... Um, the photon that we can see that has been "bent" by gravitational lensing traveled the geodesic, shortest path, to get to us. It started somewhere, shot off at c in a direction and carried its "bubble" of curvature with it, traveling through spacetime at c. It might be useful to think of time as the "numerical order of change" rather than a dimension(I can't believe I said that). Every unit of time the photon takes a step forward. It doesn't turn or fall, the path curves beneath it. Your comments about instantaneous gravitons seems to be against current standard theory. Supposing they exist, gravitons move at c. From your link, Earth's orbit is based on the Sun's location 8 minutes ago. Funny, if you think about it. It might be useful to think of time as the "numerical order of change" rather than a dimension(I can't believe I said that). Careful Pyle, keep THAT up and you TOO might just end up turning into a frozen chicken! Point being if you attempted to describe massless particles as the limit of low mass, it seems the falling principle would still hold. Ummm. Only as a word exercise. I could also say that anti-matter repulsion implies negative mass so photons with no mass shouldn't be attracted or repulsed and shouldn't "fall" at all. Unless you are suggesting there is an anti-photon with negative zero mass that "rises" in a gravitational field? It's a nice article, but the leading image should be changed. It shows an electric dipole (where opposites attract). The correct image of a gravitational dipole would have very different field lines (because opposites repel in the proposed model, and that is what allows the dipoles to align to the auxiliary field and strengthen it). ...From your link, Earth's orbit is based on the Sun's location 8 minutes ago. Funny, if you think about it. At one time I did some calculations to see what would happen if earth were attracted to the position of the sun 8 minutes before light reaches the earth. I used something like 150 m/sec for the speed of the sun travelling thru the gallaxy. No surprise - the earth and the sun would have parted company long ago. Pyle: ...photons with no mass shouldn't be attracted or repulsed and shouldn't "fall" at all. As I see it "fall" means entering an element of spacetime which is being pulled toward an object by its gravity. So spacetime is flexible. I don't know if the flex is within an element of spacetime or between elements. A massless particle doesn't distort the spacetime where it lives so it gets pulled right along with its spacetime. An anti-particle with mass distorts spacetime in the negative direction and gets repulsed from the gravitational field. As a matter of fact the greater the gravitational field the higher the repulsive force on the anti-particle. Or so it seems. But obviously your calculations were missing something because gravity propagates at c and the Earth and Sun are still dancing. A massless particle doesn't distort the spacetime where it lives so it gets pulled right along with its spacetime. An anti-particle with mass distorts spacetime in the negative direction and gets repulsed from the gravitational field. If mass attracts and anti-mass repels then no mass isn't affected. Again, unless you are suggesting there is a negative and positive no mass. Or maybe photons shouldn't be thought of as "no mass" since they have momentum/energy and bend spacetime per relativity, as not accounted for by Newtonian gravity. Pyle: the photon...carried its "bubble" of curvature with it, traveling through spacetime at c.
I don't think the photon carries any curvature. According to loop-quantum-gravity as I understand it a quantum gravity state may be represented by a graphical network whose edges consist of lines of quantized electrical flux. My guess is that the photon propagates thru these edges of quantized electrical flux. There is nothing physical to move thru spacetime, only an excitation of these lines of flux which may be curved along the lines of spacetime where they live. That is a wave of water doesn't physically move thru the water, water only propagates the wave. You might say the wave itself has no mass. The image is essentially correct - with one mistake. Positive attraction (as mentioned earlier) is always trying to bring things closer. The arrows should be pointing TOWARDS the POSITIVE pole. Not towards the negative one. So you weren't wrong about your field lines, just the reasoning to get there. If gravity propagates at c then something sure is missing. Until I find out what that is I'm going to say gravity propagates instantaeously. That is, between ticks of the quantum clock. It's really not that strange. If the universe is to remain in balance then as soon as something moves there must be an instantaneous reaction. There is an analogy with quantum entanglement. We seem to be pretty sure that this balancing act is instantaneous between coupled particles. If the particles aren't coupled then we just don't know where to look to see where nature performed her balancing act. Or maybe we just haven't figured that one out yet. Maybe so. But I have trouble thinking of water waves having mass. Please don't say photons bend spacetime per relativity. Gravity bends spacetime per relativity. @Seeker2: The nut of this is that you can't use Newtonian gravity properly and discuss gravitational lensing. Photons don't "fall" in Newtonian physics. You NEED general relativity and its curvature to understand gravity's effect on light. All of this discussion has been to correct your application of Newtonian gravity and "falling" being applicable to photons, as the limit of small mass, i.e. the feather. That is misleading and wrong. On to instantaneous gravity. The gravity around a mass is a static field. My nonsense about "8 minutes ago" is just that, nonsense i.e. "funny". The example in the paper was an instantaneous "removal" of the sun and that it would take the Earth 8 minutes to notice. We know of no way to instantaneously remove a mass, but the idea was that the change in the gravity field would take 8 minutes to get to Earth. The LQG comment is baffling to me. Electrical flux? I think you took a wrong turn there somewhere. Besides, LQG hit a stumbling block with the GRB observations. But I have trouble thinking of water waves having mass. There is an analogy with quantum entanglement. Please don't. You analogies need more analogousness. Entanglement and gravity are different animals. Go ahead and develop it, but it looks like another wrong turn. Inertial mass of a massless particle? Pyle: ... LQG hit a stumbling block with the GRB observations. Well ok. Tell us more about what bends or curves spacetime. Please. "LQG hit a stumbling block with the GRB observations." LQG predicts a "graininess" of space. Results from Integral seem to show that the limit of graininess is smaller if it in fact exists. http://www.physor...ein.html There have been further developments that overcome this, go to physicsforums if you are interested. Beyond the Standard Model. Really? More semantic garbage. I don't know what you are after here. Mass creates curvature - has gravity - attracts mass. You want an explanation of Higgs theory? Or maybe some Quantum gravity or LQG? Go look it up. Sorry I couldn't help. You seem like you'll figure it out on your own no problem. Seeker2: Well ok. Tell us more about what bends or curves spacetime. Please. Sorry about the semantic garbage. Science is a bit technical it seems. I was aware mass has weight in a gravitational field. Take it up in space however but don't expect your tools to be attracted back to the spacecraft on your space walk. They could just float away. Seeker2:...But I have trouble thinking of water waves having mass. Yes I've been thinking about this problem. As I see it you could fly a bottle of water over the Pacific faster than a tsunami if you took a supersonic flight. Point being I see no connection between moving a medium and propagation speed thru the medium. Applying this idea to light, the speed of curving spacetime or propagation of gravity has nothing to do with the speed of propagating e/m waves thru it, as I see it. I think you are conflating gravitational waves with a static gravitational field. Gravitational waves are thought to be the result of interactions of massive bodies. These waves are minuscule for objects such as the sun and Earth. The theory suggests that for binary pulsars the effect might be measurable by current technologies, LISA. A photon's "interaction" with a gravity well is the photon following the curvature of spacetime. Sure, you can say falling, but don't try to make a link to Newtonian gravity because photons don't have the rest mass required to do that. That is why Einstein's GR replaced Newton's gravity. Your point about bottles and planes with tsunamis is lost on me. Propagation of gravitational waves, gravitons, and propagation of photons is probably related, but I don't understand your point. Light moves at c in a vacuum. Again, I think your problem is a confusion of static gravity fields and gravitational waves. Pyle:...I think your problem is a confusion of static gravity fields and gravitational waves. Strange. I see no possible connection between the two. Well I guess you're right. The formula for earth's gravity does not depend on the mass of the object being accelerated. Is the photon an object? Point being the gravitational field of an object is an integral part of the object itself. When the object moves its field moves right along with it. So gravitational waves from moving objects move precisely at the speed of the objects themselfves. A good example would be waves from binary stars. The trick is the waves come from the position where the objects actually are in real time, generally not from where you view their light. You might get lucky if the objects are still there and moving straight along the line of sight. ...The gravity around a mass is a static field. Good point. Static relative to the mass I presume. Point being if you remove the mass the field must be removed right along with it, else the field is no longer static relative to its mass. ...the idea was that the change in the gravity field would take 8 minutes to get to Earth. I think we can agree this is a fantasy at best. I thought gravitational waves were the result of acceleration of a massive body. But I do quibble. ...Results from Integral seem to show that the limit of graininess is smaller if it in fact exists. ...Dr Laurent and colleagues searched for differences in the polarisation at different energies, but found none to the accuracy limits of the data. Perhaps the theoretical maximum polarization at all energies is the same and the polarization for all energies were at their theoretical maximum. Point being the gravitational field of an object is an integral part of the object itself. When the object moves its field moves right along with it. Dangerous wording, but I think the second part is right. The other way to think of it is all motion is relative. The mass with the field can be thought of as non-moving. This is different if the mass is accelerated. A good example would be waves from binary stars. My understanding of gravitational waves was that they are theorized to be packets of energy, gravitons, that are emitted by interacting masses. Just as photons are emitted as electrons drop to lower energy states, interacting masses give off gravitational energy, lowering the total energy of the system. In the case of two orbiting masses, the energy, leaving at the speed of light from where they WERE, drains the system resulting in orbital decay. Sure. Actually quite a bad fantasy. Regarding Integral. LQG predicts a certain "graininess" of the vacuum. An anticipated result of this is the polarization of sufficiently energetic gamma radiation. Integral didn't find any so the observation predicted by certain flavors of LQG didn't pan out. Yes they are packets of energy travelling at c. How you accelerate the object, like through interaction, isn't the point. Gravitons emanate from every point in the gravitational field of the object being accelerated. It's not a point source or some more or less well defined object like the sun. It's more like a glow which pervades all of spacetime, if Newton is correct. Of course the glow is strongest where the field is strongest, near the object. ...the gravitational field of the object being accelerated. For example the earth lights up the universe like a 200 watt infrared lamp. Big deal. I thought polarization was the result of some magnetic field around the emitter. But I do quibble. Point being whatever graininess there is in spacetime, that graininess is transparent to radiation. Or at least to gamma rays. That would seem logical for any wavelengths contained in the Planck volume, since things get very fuzzy at this scale. So gravitational waves from moving objects move precisely at the speed of the objects themselfves. Gravitons emanate from every point in the gravitational field of the object being accelerated. The second quote is more correct, but the key is emanate. They emanate and then leave the area at c. That causes problems, by the way, but special relativity is there to bail us out. It's more like a glow which pervades all of spacetime, if Newton is correct. Yup. Ultimately washed out by EVERYTHING else. No, you don't quibble. You don't understand the cause of the polarization predicted by LQG. I am not going to pretend I can do the math either though. But it might be helpful to think of a polarizing lens. Light can be polarized by a medium it passes through at any point in its journey, not just at the emitter. Again, LQG predicts graininess that would cause polarization. Remember that photons are particles too. Not just "radiation". The Integral result showed none of the predicted polarization at several orders of magnitude below that level. It proved several hypothesis in LQG wrong. ...So gravitational waves from moving objects move precisely at the speed of the objects themselfves. I'm talking about waves, not radiation. ...Gravitons emanate from every point in the gravitational field of the object being accelerated. ...They emanate and then leave the area at c.
You're confusing waves of gravity with radiation. Gravitational waves are fixed relative to the mass of their origin. They follow you faithfully wherever you go. They are essentially part of the object. Like you say, the static part. Move the mass and you simultaneously move its field. However if you have to accelerate the mass, you also have to accelerate its field to keep up with it. This heats up the spacetime medium and it radiates gravitons. Right. Newton didn't think about eveything. He was followed by Lewis Carroll (Charles Lutwidge Dodgson), writing under a pen name to avoid the wrath of the conventional wisdom people, predating Einstein. Maybe so if the gamma rays were'nt already polarized to their theoretical maximum at the source. ... if you have to accelerate the mass, you also have to accelerate its field to keep up with it. This heats up the spacetime medium and it radiates gravitons. This gives me an idea. Where there is no spacetime medium you could accelerate an object with no gravitational radiation loss and no speed limit. Interesting. Check out those other universes. Or is this an unfalsifiable theory? You're confusing waves of gravity with radiation. No. You are using your own definition of a gravitational wave. Still. As I said before. You are conflating gravitational waves, gravitons, with the static gravitational field of a non-accelerating mass. Gravitational waves are analogous to EM radiation; gravitons and photons being the carriers, respectively. Move the mass and you simultaneously move its field. No. Accelerate the mass and the change in the field propagates at c. Gravitational waves. Movement without acceleration is relative, so the field could be considered non-moving. If you stick with the more well accepted definition of gravitational waves then Newton doesn't enter the conversation. With your personal definition I am not sure, so I will just stop there. Really? Polarized to their maximum? Nevermind. This has been fun. Hopefully nobody else is reading this. I'm wasting my time. "Hopefully nobody else is reading this"
Don't hope toooo much! lol! Virtual particle pair creation should also be something different from matter-antimatter pairs. M and AM annihilate when brought together: which causes a photon of equivalent energy to be emitted. Virtual particle pair destruction causes no such photon emission. Exactly. Virtual particles are created by borrowing energy from the vacuum, not energy from real (or "permanent") photons, so all they do on annihilation is return that borrowed energy to the vacuum. In a special case like the EH of a BH only part is returned; the rest becomes "real". Sigh. What a broken editor. It can't even handle a minus sign properly. I can't take it anymore. Your "common wisdom" falls flat on it's face again. First, gravitons are purely hypothetical at best, if not outright speculation. Anyone who goes on about how "Gravitons are this and gravitons are that" the way you do is just flirting with a Crackpot of the Month award. Secondly, gravity in GR can act as a static field--hypothetically mediated by virtual gravitons (like magnetic fields are mediated by virtual photons)--or produce waves that propagate at c--which would be mediated by hypothetical real (as opposed to virtual) gravitons. But in either case wave-particle duality applies: there's no difference between gravitons as the hypothetical excitations of a gravity field (i.e. "real" gravitons) and a gravitational wave except in how you approach them. They're the same damn thing propagating a c.
And as Pyle said, let go of Newton already! Meh. Combing for nuggets of wisdom, found mostly pot fragments. Not yours though. Hopefully nobody else is reading this. Care for peer-review on that? ...: Yup. In a special case like the EH of a BH only part is returned; the rest becomes "real"
Whoa! Back up. There is no return. The energy, according to the hypothesis, is stolen from the black hole, not the vacuum. You are talking about Hawking radiation, right? btw, thanks for the sanity checks/peer review. Hopefully I steered back from any left turns I made in the several weeks this thread has dragged on. That Caltech course is AWESOME. Even if you aren't interested you HAVE to listen to the first five minutes of the first lecture. I sure hope they don't yank it if it gets too popular. I want to watch it if I can find the time. Back up. There is no return. You are talking about Hawking radiation, right? Sorry, Pyle, I was all out of characters. But you're right that "return" is hardly clear. What I meant to convey by it is that, being prevented from annihilating by the BH's EH, one particle escapes while the other goes back ("returns") to contributing to the size of the BH's EH from which Space-Time (i.e., vacuum) it was borrowed. It does so by being swallowed up and falling to the BH's singularity. You are quite right, however, that by becoming separated at the event horizon, BOTH indeed do become "real". My bad. It's just that one of them is going to have a rather short lifetime. And thanks for the link, I'll definitely check it out. Now hear it from this crackpot: As I see it the source is every point in the gravitational fields being accelerated, not the objects generating the fields. Now according to Newton (hope he wasn't wrong on this one) as I understand it gravitational fields extend to the limits of spacetime. So your source is going to be every point in spacetime. Each of these points is the aggregate of the two fields in orbit as well as the radiation from all other gravitational fields in the universe. Whatever modulation in this aggregate you could find with the background radiation from the rest of the universe would be nil at best. Hope I'm wrong. Please advise. Ok, I think I can do something with that. If they do, much like photons and a magnetic field, there aren't gravitons everywhere the field exists. The gravitons are emitted when something happens to cause the release in energy. This is analogous to electrons dropping in energy levels releasing photons. Again, like photons in the electron example, the gravitons are emitted from near the interacting masses. Photons aren't emitted from everywhere the electron's magnetic field exists (similarly the entire universe, as you stated). Gravitons too would have a source at the site of interaction. One way to think of it, albeit crudely, would be to think of waves in a swimming pool interfering with each other and causing a splash. Not even close to a perfect analogy. Well how 'bout that. Crackpot recants. You knew it had to happen. After considering this and other blogs on graphitons (technically radiating graphitons) and virtual graphitons (technically non-radiating graphitons) it appears these thingies provide an important missing link my ideas about matter, gravity, and frame-dragging. But in order to do that they must live inside the object generating the gravity. Radiating gravitons radiate energy, they are NOT gravitational radiation, only the source of gravitational radiation (I know I do quibble). An analogy is a light bulb - a light bulb is a bulb (emitter), not light. (But I have been criticized for using analogies, after which someone went ahead and used them for their own purposes). My ideas about glow-in-the-dark gravitational fields are bunk. The fields only hang on as they are being dragged along by the object from which the emanate (sorry about the hyperbole). So I left out a word - missing link IN my ideas. Quibble quibble. Also from which THEY emanate. Anyway we may be onto solving one of my greatest mysteries about science - use of the word mediate. For example a hanger mediates the force which keeps your coat hanging in the closet. Or something like that. Note a possible definition of black holes using graphitons - a (massive) collection of these thingies. Note the possible dual interpretation of the word massive, both seemingly appropriate. Along as we're enforcing orthodoxy please note: It appears there is a big difference between gravitational waves and gravity waves. You write that as if there has been some ongoing confusion. There hasn't. No one has brought up gravity waves in this discussion AT ALL except you in the post I'm replying to here. Seriously dude, what's you're point? Going fishing? Sigh. More pottery shards. I'm starting to feel like an archeologist. But what a bounty! Come on Gawad. Our Cobol writing, private definition cranking, poster child finally came up with a reasonably decent analogy and you keep attacking? Just pat him on the back and let's move on to more recent articles to insert our ramblings and "help" someone else. No cold feathers here. I think I dodged frozen chickendom. Sorry. I got this confused with gravity field. Bad me. Must have been too much COBOL. I knew, KNEW the truth would finally be revealed! Pyle, that's the best piece of advice I'd heard so far this week. Ramen! Please. Let's reveal the truth as crackpot sees it. GRAVITONS ARE NOT EMITTED. Gravitons are emitters. They emit radiation. They hold matter together, especially like in a black hole. If the gravitons go away, so does the matter and the gravitational field. Or so it seems. No, gravitons, as predicted by GR, are the force carriers for gravity, analogous to photons and electromagnetism. Gravitons ARE emitted. See what I mean about having your own definitions. That clears up quite a bit doesn't it? ...That clears up quite a bit doesn't it? Yes that clears up what got me into trouble the first time. You see if fields are mediated by whatever, then when whatever radiates the radiation comes from the field wherever it is being mediated. Therefore I thought the radiation must come from the field like some faint glow. But now you have me twisted back the other way. I must be missing something somewhere besides just a loose screw or two. or even various shear effects, which are occurring with dark matter during collisions of galaxies. Zephyr, it hurt to acknowledge it, but when you're right, you're right. There are plenty of observations we have made of galaxy clusters and collisions that make this theory pretty unlikely. They are the quantized energy of gravitational attraction. ...They are the quantized energy of gravitational attraction. Sort of like the photoelectric effect for photons. Good point. Yes. But more closely relates to Gluons. Gravitational fields are not waves, only permanent fixtures of their associated object. Gravitational fields do not propogate any more than the object propagates. Of course when they're accelerated spacetime gets heated up and radiates gravitational radiation. When objects orbit each other their gravitational fields orbit with them ripples in the aggregate gravitational field. The ripples orbit the center of mass of the objects, they don't propagate or travel outward from the source. The pattern of all ripples do appear to be propagating outward from the source because they become more and more dispersed as your viewpoint moves out from the source. Since they extend throughout most of spacetime there must be some orbiting ripples passing our way. "Gravitational Waves" could be confused with the radio waves emitted by orbiting pulsars. Of course the radio waves propagate at the speed of light outward from the source. But by the time of their arrival to us the orbits have degraded. ... The total power of the gravitational radiation (waves) emitted by this system presently, is calculated to be 7.35 x 10^24 watts. For comparison, this is 1.9 % of the power radiated in light by our own Sun. (Another comparison is that our own Solar System radiates only about 5000 watts in gravitational waves, due to the much larger distances and orbit times, particularly between the Sun and Jupiter). (cont'd) These pulsars are 21,000 ly in distance so what you're seeing happened then. By now it seems likely the pulsars have moved, so what you see is not exactly what you get. The distribution of this glow (graphitons) relative to the current position of the pulsars could give us some idea about the distribution of spacetime relative to the source, at least to the extent of the field. ...In the case of PSR B1913 16, the orbit is inclined at about 45 degrees with respect to the plane of the sky. Anyway expect the ripples in spacetime to be travelling perpendicular to the line of sight. And watch out tonight for falling satellite parts. (referring to gravitons). So I suppose as gravitons are emitted the gravitational attraction decreases. ...more science will have to be done before anything definitive can be declared. ...Particles are given mass by compressed units of spacetime. Compressed into various shapes by various forms of the strong force. This causes neighboring units of spacetime to be stretched apart. They don't like being stretched so they or whatever it is that holds them together pull back, resulting in what we see as gravity. So spacetime is elastic (compressible and expandable). It can also be compressed (or curved as Einstein would say) by turbulence, like during the big bang. This (DM) attracts other compressed elements like the spacetime around (and including) normal matter, resulting in galaxies, black holes, and whatever. It's like low pressure areas are forced together by high pressure areas which are trying to put spacetime back into balance. This is only part of the story however. When spacetime is compressed into particles, neighboring elements are expanded into anti-particles. Anti-particles, having a lighter density than normal spacetime, are expelled to the far reaches of spacetime by something like the buoyancy force of the elastic medium holding spacetime together. In addition, high pressure areas push each other away so they end up in more or less equally spaced regions in the far reaches of spacetime. One can easily imagine what happens when matter and spacetime is sucked up by black holes (probably where the Higgs bosons hang out). The anti-matter and black hole(s) are forced together resulting in another you-know-what. An interesting question is how anti-matter and matter interact. High pressure and low pressure areas don't really interact because one is pushing spacetime and the other is pulling. They don't interact as long as there is spacetime separating them. But when they are forced together after all of spacetime is sucked up into black holes (like at the big bang) all the energy from the strong forces which was used to separate them is released. BANG! Analogy - I remember sitting in class in a previous life where we were having a sort of contest blowing smoke rings up at the blackboard. Precisely what happens when spacetime is inflated at the big bang. The smoke rings eventually form galaxies. Be glad you were'nt trying to teach back in those days. Probably not. More likely one element of spacetime is split into 2 parts - one compressed (matter) and one expanded (anti-matter). The expanded one being expelled from spacetime by the buoyancy force. Probably so. We should stick to Occam's razor. The simplest procedure would be to move the boundary between adjacent elements, requiring two elements of the strong force, like the gluon which would cause one element to be compressed and the anti-gluon causing the neighboring element to be expanded. In any case these gluons don't hold on forever; eventually they yield to the restoring force of spacetime and radiate if they're not swallowed by a black hole first. You 2 are the only interested with your ramblings. Why don't you take it to a PM session. What? You are talking to yourself and Physorg doesn't have a PM Me function? I'd recommend that to the editorial staff immediately. ...And as Pyle said, let go of Newton already! Consider what would happen if Einstein would have let go of Kepler's 2nd law. We would have no gravitational radiation, which he introduced to compensate for retrograde orbits created by the finite speed of gravity. Seems like energetic radiation should be more transparent and more difficult to polarize than less energetic radiation, like light. Sort of like the trillions of neutrinos which pass through your body every second. Certainly I don't understand any polarization predicted by LQG. This would imply a preferred direction in spacetime which I seriously doubt. However you might be onto something here. It may be that spacetime does not provide a free pass for photons, that is photons may have to pay a toll in energy (to the grains) for passage, resulting in the redshift of Hubble's law. This may be just the break needed by cyclic universe theories, where as I understand matter is recycled but not spacetime. The recent tiff in cosmology about the l=20 multipoles in the CMB may also prove to be significant. These multipoles are circles, possibly representing white holes. These might provide a focusing mechanism for concentrating all radiation in the previous universe (called aeons by Roger Penrose) to a single point. I always thought this stuff about the universe coming from a singularity was just a fairy tale, but there may actually be a plausible scenario. The big whatever in cosmology may only be a phase transition from radiation to matter. In cosmology I'm not looking for absolute proof, or falsifiability or whatever. A little plausibility would be enough for me. Humans are more mysterious than the cosmos. Why we fail to see event horizon of 2030?